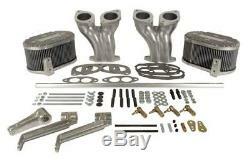 BEETLE CABRIO Manifold, Linkage & Filter Kit, Offset, IDF/DRLA/HPMX - AC1293125. CB Performance offset inlet manifold, linkage and air filter kit to fit IDF, DRLA and HPMX carburettors. The kit includes twinport offset inlet manifolds, hex bar linkage, cast air filter bases, tops, air filter elements and hardware to fit. FOR NEWS & SPECIAL OFFERS. SIGN UP TO OUR NEWSLETTER. On Orders Before 4pm GMT. Aircooled Engine parts 1.2-1.6. Aircooled Engine parts 1.7-2.0. ORDER BEFORE 4PM FOR same day dispatch. Some items require more expensive carriage to ensure they arrive in pristine condition or due to their size and weight - including panels, glass, axles, bumpers etc. Some glass items also require special packaging which will be automatically added to your order as a separate item if needed. Express orders to remote areas ie some parts of Scotland will be a 48 hour service. Very occasionally our couriers are not able to deliver within agreed timescales. Until your parts have actually arrived place your order well in advance of holiday or show dates etc. Engines, gearboxes, bonnets and some other items need specialist carriage due to their size/weight and additional packing requirements. The customer must meet the cost of carriage to return correctly supplied goods. Whilst we make every effort to provide accurate information, it is the customers responsibility to check that the parts are correct for their vehicle before fitting. Special order' parts are charged in full at the time of the order being placed. View these items & similar. FOR NEWS & SPECIAL OFFERS - SIGN UP TO OUR NEWSLETTER.